If you have ever had a go at writing a ritual for a pagan event, you will know that it isn't as easy as it might seem. You have to make sure it is appropriate for the time of year, the occasion being celebrated and the people taking part. It usually takes quite a bit of time and not a little creative inspiration to get it right. The easy option is to look for a ritual that someone else has already written, ready to use off the peg or with very little adaptation. The problems is there just aren't enough collections of good, practical and simple to use pagan ceremonies easily available. 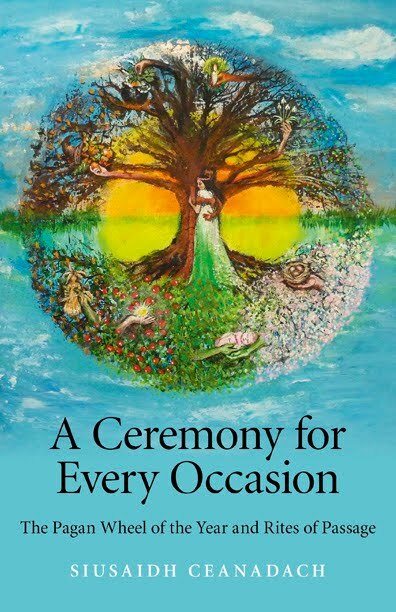 A new book called A Ceremony for Every Occasion: The Pagan Wheel of the Year and Rites of Passage goes a long way to plug the gap. Written by Siusaidh Ceanadach, who has run both Druid and Pagan groups, it is a compilation of the best open rituals she has put on over the years. The first section of the book covers celebrations for each of the pagan festivals over the course of the seasons from Imbolc to the Spring Equinox and through the summer and autumn on to Yule. The second part includes baby naming ceremonies, pagan weddings (known as handfastings), rites for burials and cremations and even words to say after the passing of a beloved pet. Publisher Moon Books says on its website: "One of the most comprehensive books on ritual and rites of passage available to date. A Ceremony for Every Occasion has been written as a guide for Pagans and non-Pagans alike who wish to celebrate the passing of the seasons, the Wheel of the Year and who need a Rite of Passage for different times in their life. These rituals are spiritual, at the same time non-religious in the general accepted term. They can be adapted and used in different parts of the world and with different deity, with a little work or simply used exactly as written." The book is very practical and easy to use, with step-by-step guides on what to do and even basic lists of all the items needed to take along to a ritual site in order to perform the ceremonies, including things like mobile phones and torches. The rituals themselves are also nice and simple - and not too long - so even relatively inexperienced pagans should have no trouble using them. If you prefer slightly longer rituals, they could be easily added to or adapted as required. They are intended to be put on by largish groups of people, but could be adapted for small groups if necessary.